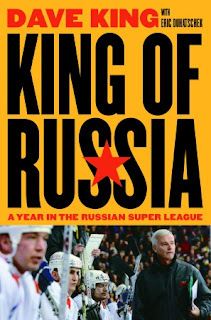 My latest summer 2011 campfire read is McClelland and Stewart's 2007 release King of Russia: a Year in the Russian Super League. It chronicles Canadian hockey coaching legend Dave King's journey to the Ural Mountains to become the first Canadian coach in Russia. The book is based on King's daily diary, typically meticulous and refreshingly open, and polished up beautifully by The Globe and Mail's ace hockey reporter Eric Duhatschek. But I was very pleasantly surprised just how compelling and fascinating the text is. One biography or well written autobiography that I've always wanted to read is that of Coach King. He is a three time Olympic coach, and formerly the one man Canadian national team king-pin. He's also coached two NHL teams and teams all over the world. As one of the greatest - although also greatly underrated - bench tacticians ever, his story potentially has so much to offer a reader - about the Soviets, about the NHL, about Canadian hockey and about European hockey, and so much more. But we also get to see so much more. By the end of the book, I'm converted in to a Metallurg Magnitogorsk fan and am looking online to buy a jersey. I feel for many of the players, much like King. King looks to former NHLer Dimitri Yuskevich defenseman to be an early pillar, and an English ally. Swedish defenseman Anders Eriksson and Canadian goalie Travis Scott are also relied on heavily. Ilja Vorobiev becomes a favorite of Coach King and of any Canadian reader. Others on the team include gormer NHLer Igor Korolev, the wildly enigmatic Stanislav Chistov and teenage phenom Evgeni Malkin, who leads the team and the league, but will soon leave the league to join the National Hockey League.